“You’ve sold out, haven’t you? You’re more about money, moving in a direction I don’t understand. Honestly, I miss the old you,” said Singapore footballer Baihakki Khaizan in an Instagram post on Monday. The 30-year-old national defender, a veteran member of the Lions team for over a decade, described Singapore's billion-dollar Sports Hub as “all fancy”, with “all the bells and whistles”. But he missed the old Kallang stadium, which was completely torn down in 2011 to make way for the new state-of-the-art Hub. Baihakki highlighted former Singapore sprinters C Kunalan and Glory Barnabas as well as retired discus thrower James Wong -- "all names that shine form our sporting past shone on your lap" -- who inspired the entire nation with their sporting achievements at the old National Stadium. "You don't seem to know your priorities anymore, and I don't see how new stars will be born in you again," before ending the post with the hashtags "#stadiumforconcerts" and "#$$$". The post attracted over 4,000 Likes and numerous comments agreeing with his sentiment. An Instagram screengrab of a post by Singapore footballer Baihakki Khaizan, expressing his opinions on the Singapore Sports Hub. Another local footballer, Khairul Amri, also lashed out at the new stadium. In a Twitter post he said: "Yes, I like the new you.Yes, I don't mind waiting for you.Yes, I'm impressed by what you can do. But, hate the one manages you." The posts come just as the Brazil and Japan football teams prepare to meet in a friendly exhibition game on Tuesday evening. Both teams voiced concern over sandy patches on the pitch, which could increase the risk of injury during the match. While the Football Association of Singapore has declared the field to be “playable” despite being “short of international playing standards”, Brazil coach Dunga does not seem impressed. Japan’s coach Javier Aguirre said pitch conditions would prevent the Japanese squad from putting on their best performance. 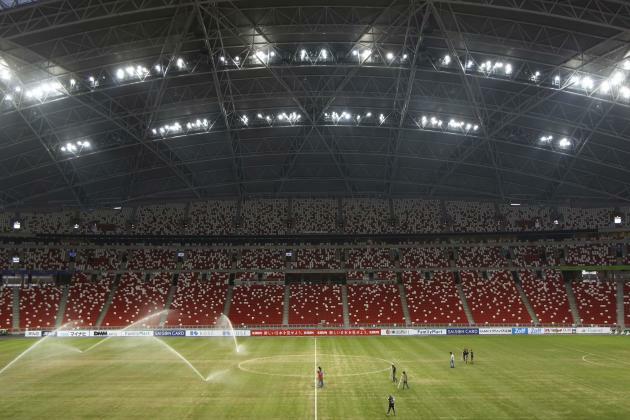 Reuters reported that the Sports Hub purchased S$1.18 million in growth enhancing lights after Italian football team Juventus played a friendly match with the Singapore Selection team on 16 August. However, the senior director of Stadium at Sports Hub, Gregory Gillin, said, "Most stadia have six months with nothing on it first before they use the pitch." No time for football pitch to recover? Since the new National Stadium opened in June this year, the pitch has been used for various back-to-back events -- including music concerts -- leaving very little time for the grass on the pitch to grow. A total of 3,000 performers from the Singapore Chinese Orchestra held a concert at the National Stadium on 28 June, followed by a Stefanie Sun comeback concert on 5 July. After the Brazil-Japan friendly on Tuesday evening, the venue will be hosting Mariah Carey’s concert on 24 October, followed by Jay Chou’s concert on 8 November and a rugby event involving the New Zealand All-Blacks a week later. While next year’s SG50 National Day Parade is scheduled to be held at the Padang, Yahoo Singapore understands that talks have already started for the NDP to be hosted at the Sports Hub pitch in 2016. Rehearsals for the mass parade can take place over several months before the actual celebration.